Last week I had the opportunity to meet the Cambridge University Eco Racing (CUER) team thanks to Mark Green (no relation!) of Intel, one of their main sponsors. 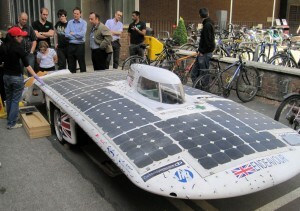 The event was held to officially launch their campaign for the 2011 World Solar Challenge. I found the team an uplifting example of what can be achieved with true enthusiasm and dedication for what they are attempting to do. 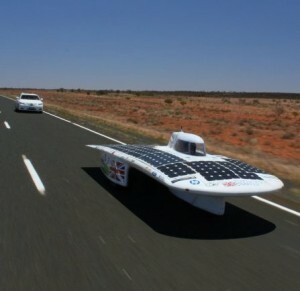 For those who have not come across the World Solar Challenge before, it is a race from Darwin to Adelaide in Australia, a distance of 3,000km across the outback, held every two years, where the vehicle has to be powered entirely by solar energy. If that wasn’t hard enough the race has to be completed in less than 50 hours! A battery is allowed but it is only allowed to store up to 5kW hours of energy, less than 10% of the theoretical energy requirement for the trip. There are also limits on the amount of solar cells which can be used. CUER first competed in the 2009 event, managing 14th place out of 26 entries – an excellent first attempt, especially when you consider the team is made up of undergraduates and doesn’t have multi-million pound funding like many of these challenges and world record attempts you see in the press. For 2011 they have set their sight on a much higher position and to achieve this they have to overcome a number of hurdles. Firstly, as is typical with student activities, nearly all of the original 2009 team have graduated and moved on, so in many ways they are having to start afresh. Funding is also a big challenge, to the extent that they cannot afford to replace their 2009 entry “Endeavour” so instead they are having to modify it based on information from 2009 and subsequent testing and computer modelling (for which Intel provides a high power cluster environment). “Endeavour MKII” however is an ingenious piece of work, with many tweaks and changes including significantly reducing the drag factor, changing the battery technology (which caused major problems in 2009), implementing a new car management information and control system, as well as improving overall safety and stability (a key point when you are in a small, light vehicle being passed by an Australian outback road-train!). With all of these changes they are confident the vehicle is up to challenging the more established teams and bringing in a much higher placing. The core technology can only go so far though; strategy and approach is also key – do you use regenerative breaking which adds weight or work on the principle that you won’t be breaking very often? What do you do when you hit cloud cover – speed through as quickly as possible risking excessive battery drain or hold a steady pace? Even at the end of the racing day (each day must be finished by 5pm) there are precious sun rays that have to be maximised by tilting the car towards the sun. CUER isn’t just about a race though, they have also created an outreach program for schools with a hands on exercise in building a working model solar racer to help educate pupils about solar energy and environmental travel. The launch event also saw the conclusion of a schools competition run by CUER to design a car of the future, a competition that generated some very thoughtful entries from over 200 entrants. The shortlisted entrants were all invited along to the event to see the car, tour the labs where the team are working on it and take part in a hands-on educational session. What’s great about CUER is that it fullfils a number of things; it’s a fun and exciting challenge, it helps inspire younger pupils via the outreach programme and it delivers some real advances in terms of technology and design that you can realistically see being used in future vehicle design. Hat’s off to a great team and good luck in October! You can follow CUER on Twitter and Facebook and look out for the launch of Endeavour MkII around July before it starts its journey to Australia in August.